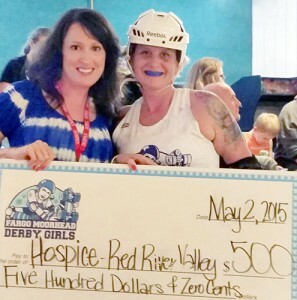 The Fargo Moorhead Derby Girls recently donated $500 to Hospice of the Red River Valley. A check was presented to Hospice during the May 2 derby bout at Skateland in Fargo. Thank you to the Derby Girls for their generous donation! Wendy Baukol, development officer with Hospice of the Red River Valley, is pictured with FM Derby Girl Sargent Largent.